A true epic: a love story that spans sixty years, generations’ worth of feuds, and secrets withheld and revealed. One day, elderly, demented Harry Eide steps out of his sickbed and disappears into the brutal, unforgiving Minnesota wilderness that surrounds his hometown of Gunflint. It's not the first time Harry has vanished. Thirty-odd years earlier, in 1963, he'd fled his marriage with his eighteen-year-old-son Gustav in tow. He'd promised Gustav a rambunctious adventure, two men taking on the woods in winter. With Harry gone for the second (and last) time, unable to survive the woods he'd once braved, his son Gus, now grown, sets out to relate the story of their first disappearance--bears and ice floes and all--to Berit Lovig, an old woman who shares a special, if turbulent, bond with Harry. 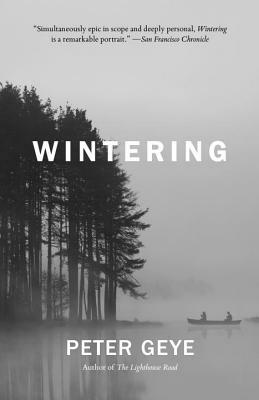 Wintering is a thrilling adventure story wrapped in the deep, dark history of a rural town. PETER GEYE was born and raised in Minneapolis, where he continues to live. His previous novels are Safe from the Sea and The Lighthouse Road.